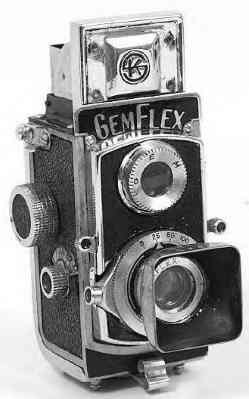 (1949) This is a tiny twin lens reflex with a pop-up viewfinder. Well, it's tiny for a twin lens reflex, but it big for a 17.5mm camera -- some would say enormous! It was made by Showa Optical Works Ltd. It has a fixed-focus GEM 25mm f3.5 lens with f-stop to f11. It sports a SWALLOW shutter with speeds of B, 1/25, 1/50, and 1/100. At least two different versions were made. One has a sports finder instead of the standard TLR finder. Accessories included a lens shade and a yellow filter. This beast even has a tripod socket! COPYRIGHT @ 1995-2017 by Joe McGloin. All Rights Reserved.